With such a perfect desert climate, Yuma is also the date capital of the world and the largest date processing center in the world is located in Yuma. The dry, desert heat, also makes Yuma a prime location for outdoor events, like the Tunes & Taco Festival in April, the Colorado River Crossing Balloon Festival in November, and the Somerton Tamale Festival in December. In addition to its desirable climate and plethora of cultural activities, many think of Yuma, AZ as a bypass on the way from Phoenix, AZ to San Diego, CA, but Yuma is so much more than just a rest stop. With endless desert activities, perpetual sunshine, and a thriving cultural scene, many Canucks are taking up residence at one of Yuma’s many affordable RV sites that Encore RV Resorts offer in this region. With a variety of resorts offering unique amenities and community sizes, you can escape the winter cold for the sunniest place on Earth no matter what lifestyle you like. Encore RV resorts like Desert Paradise RV Resort and Foothill Village RV Resort, have the same convenient amenities as other larger resorts such as fitness centers, pools, hiking and biking trails, and game rooms. And with a smaller community of residents, it’s easy to make new friends and be as active or relaxed as you want. 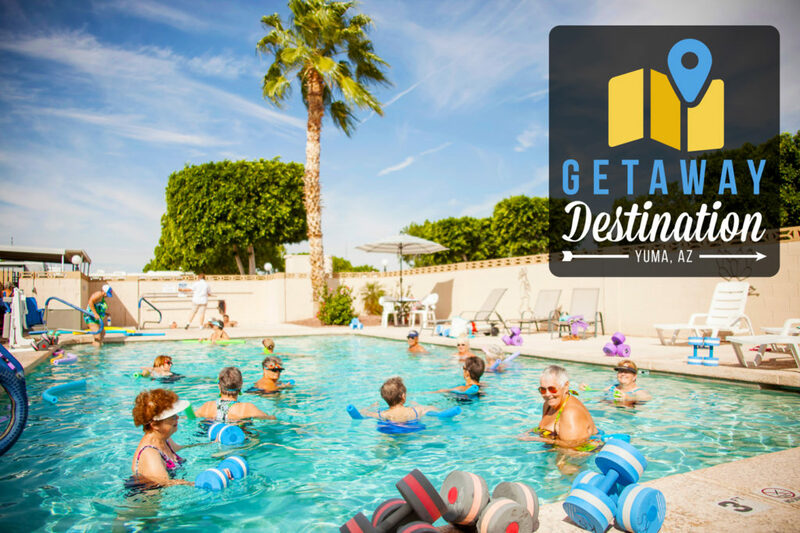 At the larger Yuma RV resorts such as Araby Acres and Cactus Gardens, residents have the opportunity to take up short or long term residence at hundreds of different sites and acres upon acres of activities to maintain an active lifestyle. Scenic roadways, friendly atmosphere, and a calendar chock full of entertainment and group activities, there is no shortage of beautiful desert scenery and space to enjoy everything Yuma has to offer. The nearby Colorado River and Imperial Dam give residents great opportunities for fishing and boating, two of the many activities that Encore guests frequently enjoy. Heading out for a day trip across the border? The convenient location of Capri RV Resort provides guests endless opportunities to experience authentic Mexican culture and still be close to the comforts of home. The Yuma Arts Center, downtown farmer’s market, and casinos are also close by to all seven Encore RV resorts. No matter which Encore RV Resort you stay at, you are no more than 20 to 30 minutes from the West Wetlands Park, which sits on the northwest edge of Yuma along the Colorado River. This 110-acre public park features a Butterfly and Hummingbird Garden, an Owl Habitat, equestrian trails, disc-golf courses, picnic tables, boating opportunities and more. Not too far from the West Wetlands Park is the famous Yuma Territorial Prison State Historic Park where visitors can walk through actual cells and solitary chambers of Arizona Territory’s first prison. Visitors can view photographs and exhibits of those who were incarcerated here for the 33 years that the prison was in operation. In fact, there were inmates who were imprisoned here and also helped to build the prison itself. In cooperation with the Yuma Quartermaster Depot State Historic Park, the Prison holds activities every February to coincide with Yuma Crossing Day, a day mean to highlight the historical eras of Yuma’s past, from the arrival of the Spanish in the 1500s to the mid-1900s through living history re-enactments. Whether you’re looking for a smaller RV resort with those big amenities, or because you want to be within close proximity to casinos and outdoor activities, Encore RV resorts in Yuma are a snowbird’s paradise.